“I have found, as a local leader in communities and churches, that others do not know what to do with you if you identify yourself as an artist. Things go much more smoothly if you are a lawyer or accountant. In church and parachurch ministry leadership training, those who do not ‘fit into’ the agenda of preset programs are often marked as hard to disciple, or even as unfaithful.”2 In the cases of Emily and Vincent, their vision and spirituality was rejected outright, yet the power of their perception lives on, ministering soul care to future generations. 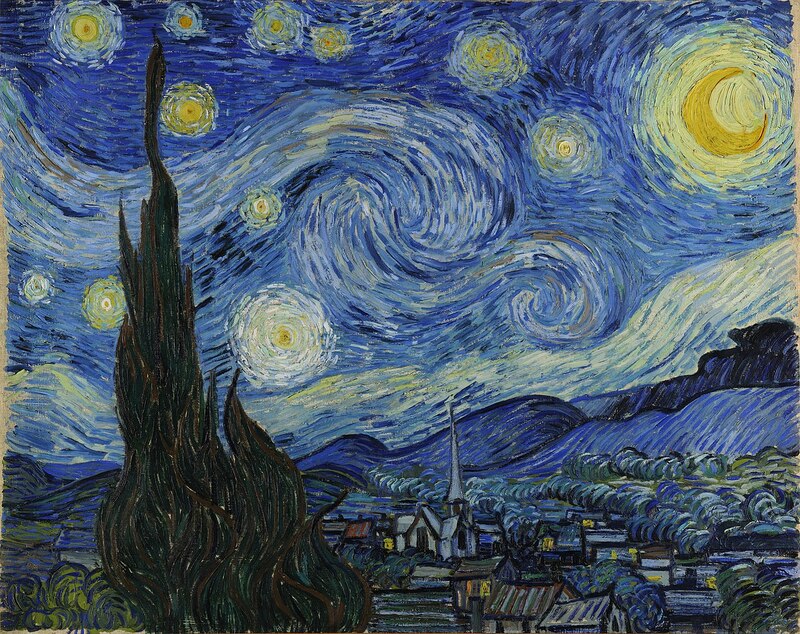 Fujimura points out how Vincent’s painting, Starry Night, addresses a shortfalling: “The painting is set in Arles, France. Notice at the very center is a white Dutch Reformed church … the dominant cypress tree on the left … and the church are the two forms that connect heaven and earth. Without the church … there is no visual center to hold the painting in tension” and yet “the church is the only building that is completely dark.”3 Even so, Fujimura points out, the power of God’s creation swirls all around, in testimony of sun/moon worlds not yet fully realized. Last night I started reading God is not Yet Dead by V. Gardavsky, a book I was introduced to within the pages of Run with the Horses by Eugene Peterson. Why is a book about a prophet, referencing a book written by an atheist, demanding my attention? It summarizes my 2017 experience, caught in the clash between two systems of thought and belief. These books, and a bowl of shriveled beets on my kitchen counter, give me perspective. In 2017, I suffered through the petty meme-induced, twitter-fed, mud brawl of culture that has become the dominant news-feed of American society, as did we all. What is this landscape that we have created, where animosity and shaming the “other” have become mainstream on all fronts? 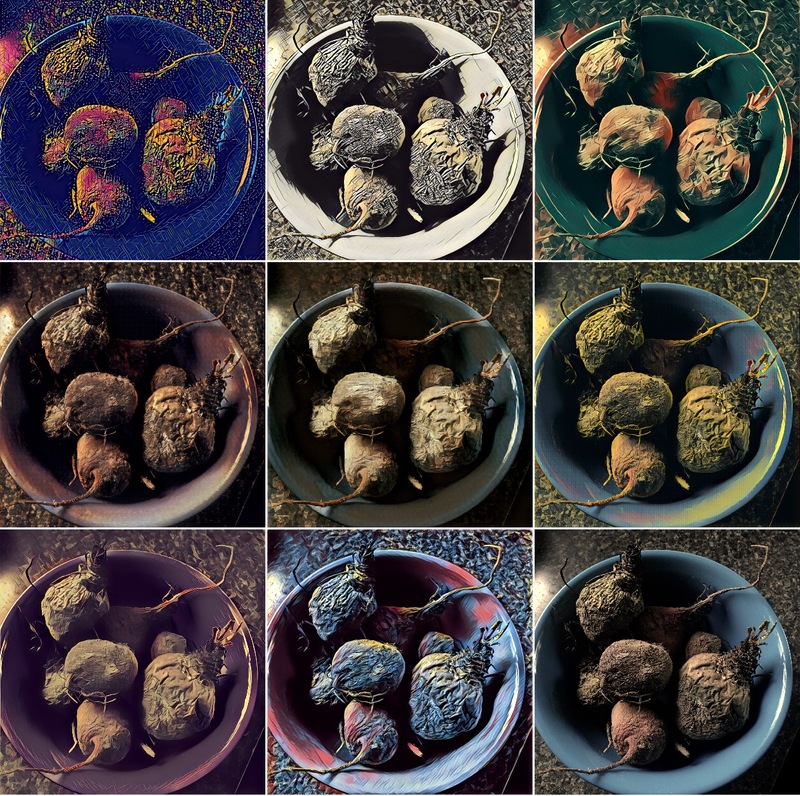 Why does my discovery of beet leaves in a bowl of decay give me hope? Because, like Gardavsky, I must look to an answer to the decayed civil landscape by ‘digging down to the roots.’ What looks ugly and wrinkled in a state of decomposition, like the uncivil state of Western Civilization, remains the source of life even so. Beet roots of latent, mold-covered energy are not yet dead; a mid-winter shimmer of burgundy and chartreuse life springs forth from it’s shriveled mass. A resident pattern of regeneration testifies to Life. On this we can all agree. How the pattern became resident has been the matter of debate since human-measured Time began. Was the pattern created or accidental? If created, then the hope of Life originates and remains in it’s created Source and all men are created equal, with blind-folded Justice consulting an absolute Morality outside ourselves, often called God. If accidental, then the hope of Life has evolved and our trust must be in the evolutionary system and Ourselves as its accidental, yet sagacious spawn. Justice is determined by ever evolving moral conduct as determined by genius-leaders at the top of the evolutionary matrix. These are the twin roots of our info-wars. As an artist who mingles between these two camps in a cultural estuary of fresh water and salt, I must guard against becoming reactionary, and instead point to the pattern of regeneration found in each system. It is my job to help create a generative culture of green-leaved connection. This mandate I have gained by reading another book, Culture Care by Makuto Fujimora. More reflections on that later. A resident pattern of regeneration testifies to Life. It is my job to help create this generative culture through my work. For inspiration, I turned to two art books that have been my constant craftsmanship companions throughout my career: The Artistic Anatomy of Trees by Rex Vicat Cole and Anatomy and Drawing by Victor Perard. The former was discovered in a college bookstore while I was studying studio art at Kent State. 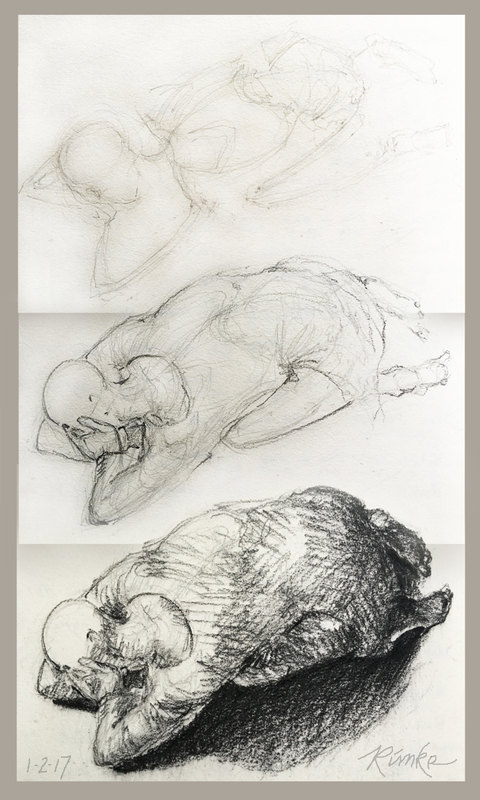 The latter came to me on recommendation of artist Judith Carducci, who shared during one of her figure painting workshops how she copied drawings from Cole’s book as a young girl. It certainly gave her a rock solid understanding of the bone and muscle structures underneath her portraits that make her colors and pastel work sing. January was spent in efforts to copy something, anything from these books as the darkness all around me pretty much blanketed my imagination like wet snow over buried seed. Lynda Rimke Daily Sketch Challenge copies of Victor Perard and Rex Vicat Cole & etc. Now, in mid-February, I am feeling the energy of longer days, and am in a better place to act on what inspiration may come with more skill than before. But that will be the next blog post! Today’s daily sketch is of our funky broken cistern. It’s pouring rain today and this cistern is usually overflowing with run off that pours out of the faucet. How all that water gets there is a mystery that we still need to solve while the oldest living owner of the house is still around. We’re fairly certain that he constructed the cement holding tank under the addition crawl space which drains through the faucet, and dribbles a cloudy, lime and calcium laced mix into the cistern that is in the corner of the original basement on days like today. Except that Patrick got tired of running the neighbor’s pump to keep the cistern from overflowing on rainy days and has since constructed a bypass, so the run-off is neatly piped to our basement drain that goes directly to the pond. No shortage of water here. But in Israel at the time Jeremiah lived, people could get dangerously parched. Folks dug cisterns to store enough water to get them through the summer, when everything dried up. If a cistern was cracked, it was broken and useless. 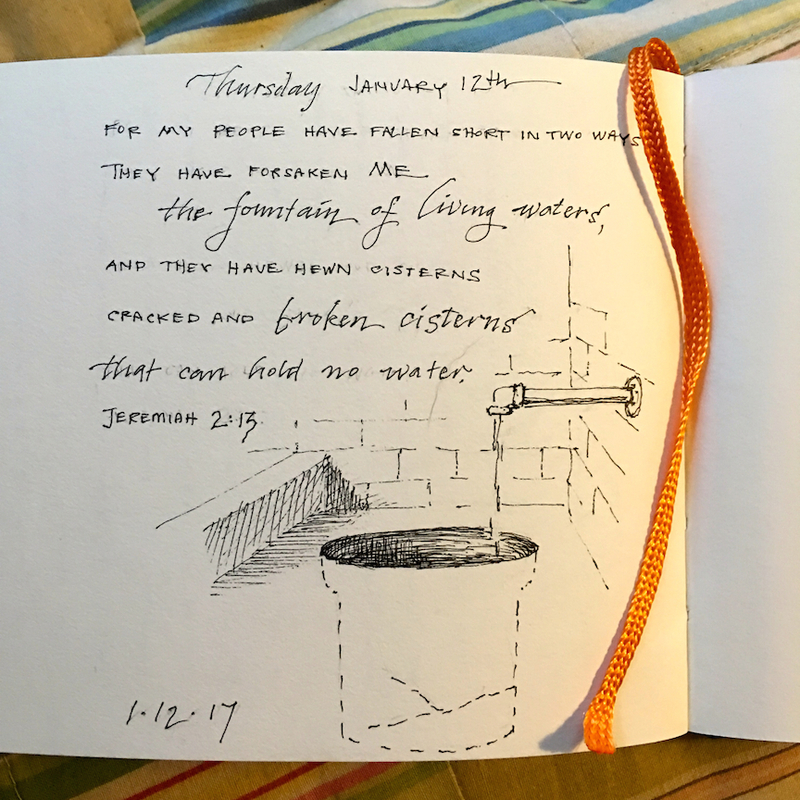 As I sought to illustrate Jeremiah 2:13 during my daily sketch time, I realized our own cistern does not hold water over time, and is therefore the perfect reference material. We can’t see the cracks, but they are there, deep down and hidden to us. Should our well fail one day, this cistern is not reliable when things dry up. But we just bought the property up the hill with the spring that was once the source of water for this house. The oldest living owner also built a holding tank at the head of the spring and carved his name in the wet cement. Crickets and frogs now reside on it’s cool inner walls in the summer. We really need to talk to this man to find out how this tank at the spring head and the mystery tank under the addition were once connected. Cracks do form, deep down within my subconscious being, and allow my sense of fulfillment to leak out and leave me dry. Jeremiah says I can’t rely on stored cistern water from past rains, but need to keep going to the Source, the Fountain of Living Waters, which is our Creator. All of Jeremiah 2 expresses His amazement that His beloved people would choose anything less, when He is offering the deepest fulfillment He designed us for. That living water is always with us and in us who believe, and naturally, like a river, finds its way to others. I have been reading The Artisan Soul over the last several months, and have developed a conviction that I should create more sketches from my imagination when I make daily art. I’ve always admired artists who can do this well, but rarely take what feels like a leap of faith myself, sticking to creating art from what I see in front of me in life. 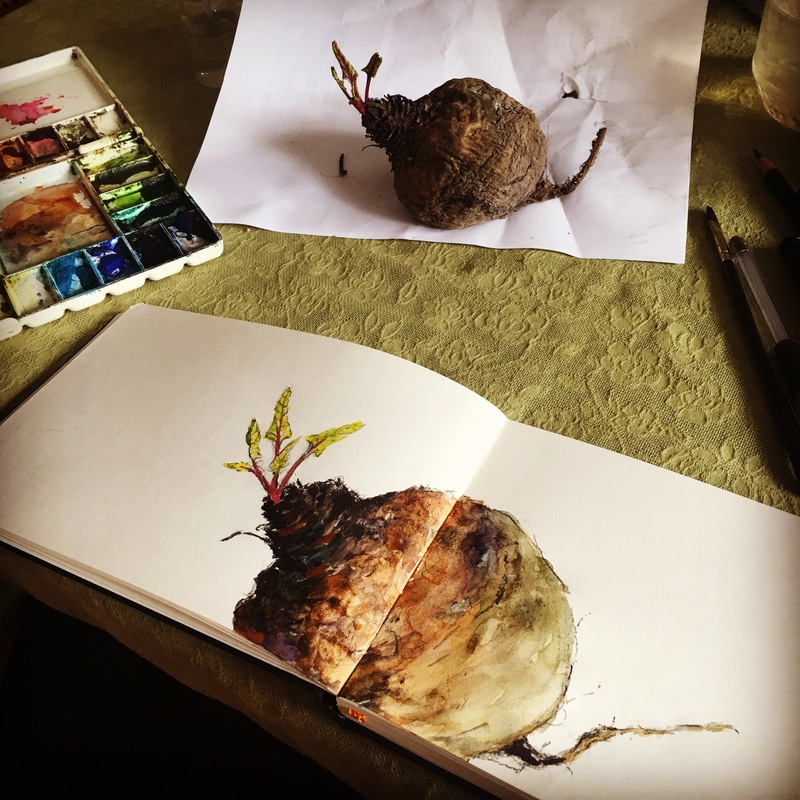 I am halfway to Imaginative Realism when I succeed in creating art from life observations! I am creating daily art this year to continue to develop those fundamental skills; to give myself an imaginative vocabulary. This morning I acted on what I saw in my imagination when my husband and I read the book of Job, chapters 1 and 2, after dinner last night. Job has just received bad news four times over: the loss of his cattle, the loss of his sheep, the loss of his camels along with several servants, then … the loss of his ten adult children. How does he respond to these four calamities? In my minds eye, I saw a bald man huddled on the ground. My process is grounded in life observation. The ribcage is 2 heads long and the pelvis about 1 head high. The clavicles (collar bones) are 1 head long each. The humorous (upper arm bone) is 2 heads long and the ulna and radius (forearm bones) are 1 1/2 heads, or 2 if you include the hand. The hand is 3/4 head and can cover the face. The femur (upper leg bone) is 2 heads long and the tibia (lower leg bone) is also 2 heads if you include the bottom of the foot. I then added arm muscles with 5B pencil to give the near arm form: the deltoid is somewhat heart shaped from above, and the bicep lies under it. I outlined the torso, thigh and calf of the near leg and drew a rough hand and feet to express extreme grief. Job tore his mantle, which in ancient times was the outer garment worn by men of wealth or status. (Cook) This meant he was probably still wearing a tunic of sorts underneath, and I have taken liberty to dress him in punjabi-style tunic and pants. The final sketch is in charcoal pencil. To express the intensity of the scene I created a heavy cast shadow. My daily art sketch of Job took about an hour to develop. I spent about a half hour compositing the process in Photoshop, another hour writing my post in a text editor, and a half hour posting. Job is one of my favorite books which has been a source of comfort to me during my life’s losses and trials. I admire how he kept his integrity, and willed himself to not blame God when things went terribly wrong in his life. That he could continue to worship and honor God as his Source (El Shaddai) after getting hit with horrible news is pretty amazing. I hope this image inspires others to hang on to God and not let calamity destroy that precious faith connection to the Source of all Life. In 2017 I have resolved to make daily art. This means drawing a 15 minute to 1 hour sketch, and painting twice a week or more. These are my only new resolutions for 2017. In the past, I have told myself to do these things but somehow the ball gets dropped. Maybe some blog accountability with help? Getting enough exercise and eating with moderation are resolutions that will continue, along with working responsibly, walking with God and being a kind-hearted human being. Simple enough … These are the foundational things that help the artisan soul and make my life into a work of art, which is what is most important. 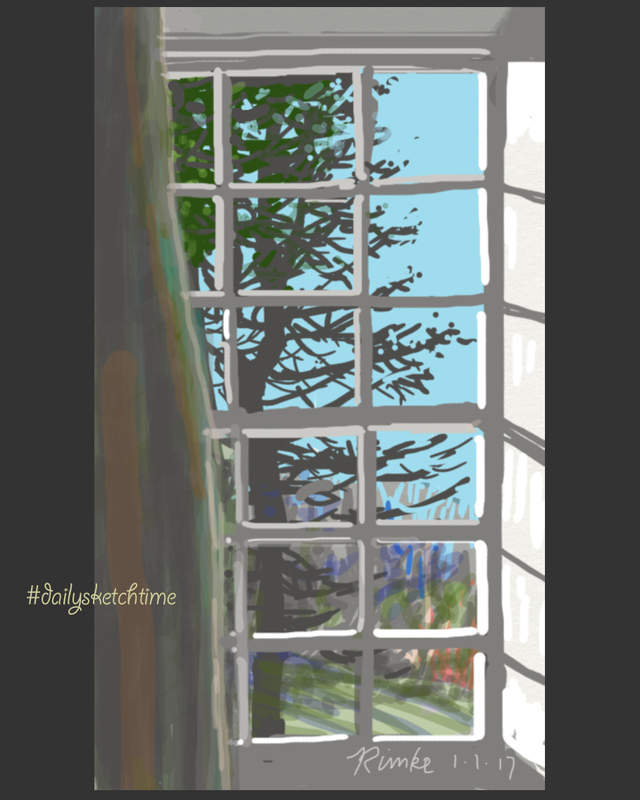 Therefore, this morning, I used SketchTime on my smartphone to catch the dying blue spruce out my living room window.